Now that you have installed JungleBell, you can start activating its features. This feature creates JungleBell configuration lists required for the JungleBell functionality on this site collection. Log in to the top-level site in the SharePoint site collection using a site collection administrator account. Go to Site Actions > Site Settings > Site Collection Administration > Site Collection Features. Locate the “EnovaPoint JungleBell Core Lists” feature and click the Activate button to activate the feature for the entire site collection. Note: You must repeat these steps for each site collection on which you plan to use JungleBell. After the activation of this feature, you will notice few new lists have been created on the top-level site in the current site collection. 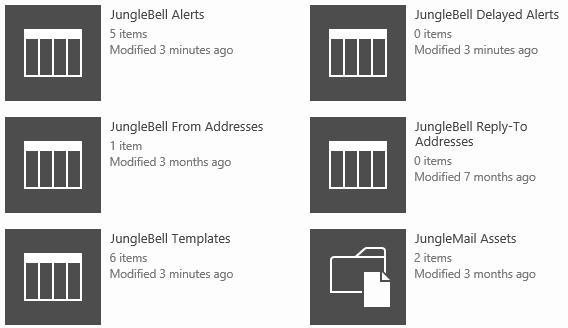 This feature enables the JungleBell ribbon button for creating new alerts from SharePoint lists. Log in to the SharePoint site using an account with Manage Web Site permissions. Go to Site Actions > Site Settings > Site Actions > Manage Site Features. Locate the “EnovaPoint JungleBell User Menu” feature and click the Activate button to activate the feature for the current site. Note: You must repeat these steps for each site on which you plan to use the JungleBell user menu. After the activation of this feature, you will notice a new ribbon button in the lists and libraries on the current site.